New to beekeeping and don't know where to start? Want to get more insights into beekeeping? Get beekeepers' stories here. Many friendships with beekeepers and lovers of honey and bees have been forged through this website. It's such a privilege to be able to learn about the bees, their honey and keeping bees from these heroes and heroines. I call them heroes and heroines because beekeeping is definitely not something for the faint of heart. It is a practice set in motion by the ebbs and flows of nature, demanding a great deal of energy and patience from the care-giver. The beekeeping journey has been described as a long and courageous march from an unknown beginning toward an unknown ending. It is for those with a quest for love and knowledge. And when you read the stories of each of these beekeepers whom we have interacted with, you will know what I mean. Enjoy! 1) If you want to learn more about "how do bees make honey" and the craft of beekeeping, check out this book (Click on book image), "Robbing the Bees" by Holley Bishop who presents an entertaining history of beekeeping and honey by telling her own personal story as a bee lover and a beekeeper and describing the life cycle and hive environment of the busy insect. Also found in this book is the story of the Africanized bees which were introduced into Brazil in the 1950's to create a strain which would do better than European bees in Brazil's tropical climate. 2) Meet John Smith, the beekeeper. I have not known one who is more vocal, more persistent, and more resolute in getting this world to know the precious benefits of honey than John. 3) Marion from North Texas finds beekeeping a totally inspiring and rewarding experience. 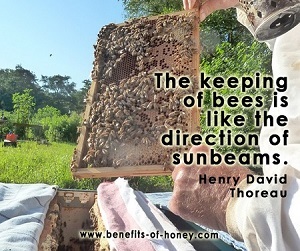 He loves to share with you what he has learnt about Keeping Honey Bees. Also join us in my conversation with him about bee keeping and honey bees in Marion's Bee Keeping Journey. 4. What Erika Cornish, a beekeeper from Canada, has to say about good beekeeping practices and good honey: The Beekeeper and Good Honey. 5. Get insights into beekeeping: how to overcome fear of buzzing bees, do bees sleep, can bees recognize their owner? All in An Interview with a Beekeeper. 6. Beekeeper Geoff believes that bees have an infinite capacity to make you look foolish: An Up-Close Look at the Bees with Geoff the Beekeeper. 7. Meet the beekeeping couple at Wing Wo Bee Farm in Shatin, Hong Kong: In Search of Honey and Bees in Hong Kong. 8. Beekeeping is a hobby that anyone can endeavour, even for those dwelling in the most crowded city: A Case for Urban Beekeeping in Singapore. 9. New to beekeeping and don't know where to start? Tips for New Beekeepers. End of "Beekeeping Stories and Resources" Back to "20 Amazing Honey Bee Facts"